Should I do “spring cleaning” in the orchard before spring comes? Keeping a “clean” looking orchard is more than just cosmetic, it is a sanitary practice that will result in a more plentiful, better looking fruit. Grandpa has good suggestions for the most common orchard “clutter”. Probably most back yard fruit growers keep their little orchards well mowed and maintained to a state where it might look like an extension of their lawn. But, if you aren’t one of those people, then it is a good idea to at least mow fairly short at the end of fall or early in the spring so that rodents, like mice and voles, don’t have a lot of cover for the winter to hide in. Mowing also will cut up and mulch the leaves— thereby removing a source for fungal inoculum such as scab and other leaf diseases which may have affected the prior years production. You will never remove the threat of infestation, but you can likely mitigate the severity of a problem the next season by either finely cutting up the leaves or even removing them if you had a severe problem the year prior. A little extra nitrogen fertilizer broadcast over the grass will also help speed the decomposition of the mulched leaves. This extra nutrient will then be available for the trees to use later on also. If excess fruit has dropped from the trees onto the ground during the winter, most likely it has had a good chance to decompose. If not, then mowing over it will also help to speed this process along. If there is a real excess of drop fruit, then you may want to pick it up and remove it to a compost pile outsideof the orchard. A few years ago, Grandpa was invited to speak at a fruit school, and another speaker who had a thick accent gave some great advice about removing dead or dried up fruit still hanging in the trees. He said “If you don’t remove the Mommies, then you will never have good disease control, no matter how hard you spray!” Of course, he meant “mummy fruit”, but it was good for a chuckle and correct advice too! Mummified fruit is commonly the result of heavy scab infestation in apple and pear, and uncontrolled brown rot in stone fruits. The best solution is to remove it from the trees right away when you see it during harvest. But, no matter how hard you look you will likely miss picking some fruit which will then hang in the trees, get diseased, dry out and remain over the winter if you let it. It is best to get mummified fruit totally out of the orchard, rather than to just drop it on the ground. It is one of the prime sources for disease inoculum along with an excess of poorly decomposed leaves. Of course, you will properly and judiciously trim your trees on an annual basis, right? Repeat after me……. “I will trim my trees this spring”! It is best to remove the tree trimmings, rather than just mow them up. If your apples or pears had some fire-blight the previous year, then some of those trimmings carry the fire-blight bacterium. Get it out of the orchard and burn it up. 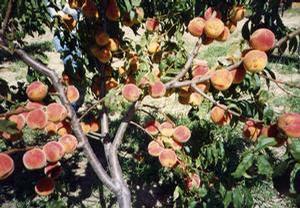 Even stone fruit trimmings can carry some diseases and insects that you would rather not encourage for the coming season. Early dormant sprays for peach leaf curl, fire blight, and other diseases can help to reduce re-infection and problems later. “Copper compounds” are some of the most widely used dormant sprays for bacterial and fungal diseases. “Oils” are often used at the same time to help control many types of insects and scales by smothering them. If weeds have been a real problem that can’t be controlled by mowing them on a timely basis, then proper herbicide sprays can help. But use caution when using them. Spray’s are not just harmful to weeds, they will also do harm to the trees if they are not properly used as labeled. For some operations, timing is more critical. Dormant sprays need to be applied before leaf and blossom buds swell and break dormancy. Mummy fruit should be removed before spring, and especially before growth starts. Herbicides should be applied according to the label and at recommended times based on the weeds or grass targeted. HINT: Leave a little bit of natural vegetation right around the base of trees so that predator insects still have a “home” for the family to overwinter. There are many predator insects living in the grass and weeds at the bases of trees that help control many other more destructive insects. Fertilizer is best applied before growth starts so that spring rains can take it down into the root zone. Winter is too early. Blossom time is usually a little too late, but it beats no fertilizer at all. Trimming is best done late in the spring if possible, before dormancy breaks. If done after dormancy breaks, then those nutrients that have already come up into the limbs from the roots will be 100% lost. Compensate with “slightly” more fertilizer. If you trim, later in the spring or early summer, you are causing other things to happen to that tree than you might expect. This is called summer pruning and it is a different cultural practice entirely. Mowing to mulch leaves should be done in the fall when they have fallen off, or early in the spring. Otherwise, mowing is a cosmetic action to make the orchard look pretty for the most part and to reduce grass and weed competition. Interested in learning more on growing tips ?